Skin is the largest part of your body and no wonder taking care of it like a pro is mandatory. Having a gorgeous skin with utmost skin pampering is crucial and therefore by understanding the need of the hour, L'Oreal skin care brings to you an all new range of skincare products. The brand L'Oreal is beating all the odds and providing utmost skincare options for a gorgeously plumped, clear and healthy looking skin. Therefore, TJC takes extreme pride in introducing sought after beauty products from the brand itself to let you breathe magic with your skin. Having a good moisturiser and you have won half battle. As for moisturizer stays on your skin for the longest hours and nourishes the skin deep within, it should be powered with magical ingredients. At L'Oreal laboratories, researchers have made it a point to bring products that are all things effective and replenish skin like a wonder. The moisturisers have acquired hefty good words from the masses that ignoring it would be nothing less than a crime. A day cream and a night cream are essentially the key products one would need to give skin the required glow and moisture. 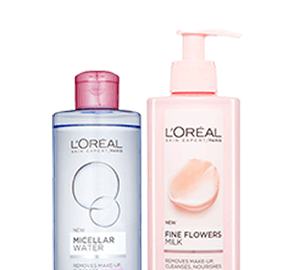 L'Oreal creams significantly possess a formula that is every way enriching the skin and keeps the skin dullness, oiliness and wrinkles at bay. Trust its various range for ideally dealing with skin and the problems that arise. A good clay mask or a miraculous ingredient-riched face mask is again everything to give the skin that extra boost. After all, who wouldn’t invite the skin with a glow and plump it requires and deep cleansing the pores. L'Oreal clay mask has active ingredients to clear the pores and amp up skin with the flawless glow it was in dire need of. In the modern skincare regime, a good skincare does not go sans a brilliant skin serum. Hence, loreal serum comes to its rescue. With potent ingredients and techniques, the serum works like a miracle to revitalise skin with continuous usage. Now combat the skin issues and plump it up with the glow so needed. TJC’s wide range of Loreal skin care products will certainly help up in renewing your skin and making it seamlessly gorgeous.